With a long introductory period on balance transfers and new purchases, the American Express Cash Magnet card is a good candidate for transferring a balance as well as keeping around in the long term for its cash back rewards. The American Express Cash Magnet card is a little less of a draw for cash back than its name might imply. The card is a simple 1.5 cash back card in a market already flooded with 1.5 percent cash back cards. However, the introductory bonus is competitive with other cards – adding a little extra incentive to sign up. The Cash Magnet card offers a flat rate of 1.5 percent cash back on every purchase. At this point, there are so many cards with 1.5 percent cash back rates, including the Chase Freedom Unlimited card which leads the trend, that this new card barely merits an eyebrow raise, unless you were yearning for an American Express card that offers 1.5 cash back. If you’re looking for a great flat-rate card, you’re probably better off with the Chase Freedom Unlimited card, which is far more versatile and allows you to transfer rewards to other Chase cards, or with the Citi Double Cash card, which offers up to 2 percent cash back on every purchase – 1 percent when you make the purchase and 1 percent when you pay your bill on time. The Cash Magnet offers an introductory bonus of $150 after spending $1,000 in the first three months. Luckily, the spend threshold is achievable for the average spender – only requiring about $334 each month. While the welcome bonus on the Cash Magnet isn’t the best available, it is pretty standard for a card of its class. That being said, if you are looking for an American Express card, the $150 is a nice added bonus. The Cash Magnet card not only keeps things simple for you by offering the same rate on every purchase, but makes it fairly easy to redeem your cash back. Your cash back never expires, and, as soon as you collect $25 in cash back, you just log in to your account and redeem your rewards for statement credits. As a drawback, the card has a rather limited range of redemption options, including cash back, merchandise and gift cards. As mentioned, the Chase Freedom Unlimited card offers far more versatility, allowing you to redeem your rewards for a large variety of options, including travel rewards, and to transfer your points to other cards. Also, if you are aiming for ultimate simplicity, the Capital One Quicksilver card allows you to redeem any amount of cash back and to set your account to automatically redeem your rewards once you reach a certain threshold (and, it doesn’t charge a foreign transaction fee). On the plus side, as an American Express card, the Cash Magnet card comes with the standard set of American Express benefits, which means: It offers above-average benefits for a no-fee cash back card. You get a full set of protections, including car rental insurance, extended warranty, purchase protection and return protection. You’re also entitled to some unique services from American Express, such as free roadside assistance, ShopRunner membership and the American Express car purchasing program. 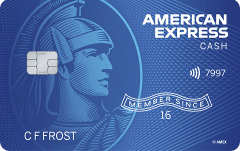 Why get the American Express Cash Magnet card? You want a simple cash back card that doesn’t require enrollment or keeping track of bonus categories. You want to cash in on an introductory bonus with an achievable spend threshold. You are looking for a good flat-rate card to pair with your American Express Blue Cash Everyday or Preferred card. Use the card for every purchase to earn a high rate of 1.5 percent cash back. Spend at least $1,000 in the first three months to earn the introductory bonus. For additional advice, check out our complete guide to transferring a balance to your American Express card. For rates and fees of the Amex Cash Magnet, please click here.